In January 2007 Johan Museeuw admitted to doping in the final year of his career, but the former top Classics rider has now elaborated and suggested that he used banned substances for far longer. “I am the first to admit it openly, and perhaps many people will blame me that I break the silence, but it has to be done: taking doping was part of daily life for almost everyone back then,” he told the Gazet Van Antwerpen. At a time when Lance Armstrong decided not to contest USADA’s charges against him and at least ten of the Texan’s former team-mates are understood to have given evidence, Museeuw is arguing that the moment is right for people to come forward and be fully open. “We must break with the hypocrisy. The only way to come out of that murderous spiral is to tackle the constant denial, the silence that continues to haunt us. Museeuw was one of the top riders of the past two and a half decades, beginning as a sprinter but soon developing into a more complete rider. 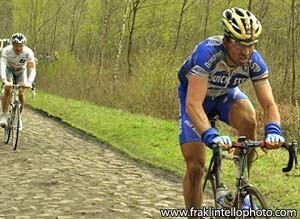 He won the Ronde van Vlaanderen and Paris-Tours in 1993, then went o to take two more editions of the former. He also took Paris-Roubaix in 1996, 2000 and 2002, returning after a bad crash in the race in 1998 which almost cost him his leg. Other victories include the Amstel Gold Race, two stages in the Tour de France, two editions of cycling’s World Cup and the 1996 world road race title. The period when he raced was one of the most affected by EPO and other substances; that forced riders to make tough choices, and each one who joined the pharmacological war put pressure on the others. Fortunately he believes the climate has changed, although he also argues that it is dangerous to forget the past. He argues that riders should admit to what went on, but also believes – unsurprisingly, perhaps, given his vast palmares – that stripping people of their results is of little value now.